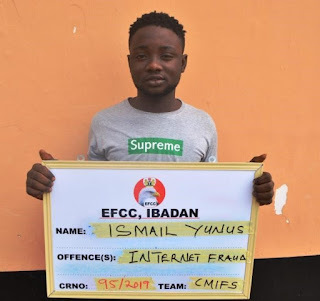 The Economic and Financial Crimes Commission, EFCC, on Monday arraigned one suspected internet fraudster, Ismail Yusuf before Justice Joyce Abdulmalik of the Federal High Court 2, Ibadan division. Yusuf was arraigned on a five-count charge bordering on advance free fraud, obtaining money by false pretense and sending pornographic images, among others. The accused had earlier been brought before the court on March 18, 2019, but the commission could not arraign him because he had no legal representation. According to the charge sheet, Ismail defrauded two American citizens, Steve Harvey and David Beeck, at different times, as he posed to be whom he was not to disposes them of their money. Consequent upon his ‘not guilty’ plea, the prosecution counsel, Shamsudden Bahir, prayed the court for a trial date and an order to remand him in prison custody pending the determination of his case. Pleading for a bail through his counsel, the presiding judge refused an oral bail application brought on his behalf by his lawyer, Okunyemi Tajudeen, thereby turned down the bail sought for. The matter has been adjourned to 14 May 2019 for trail, while the defendant was to be remanded in the Agodi prison custody.